I have a lot of runner friends - like serious half marathon/marathon type runners. Their dedication amazes me and sometimes confuses me (running in the rain/snow/extreme heat)? Almost all of them also complain about their knees. I've had some pretty good success in converting them to running as cross training and I look forward every year to teaching a 6-week Yoga for Runners session leading up to the annual Munford 5K race. And now with race season really heating up, a few of my friends are in danger of being sidelined by knee pain. It's even slowing down Natalie's training schedule for the Disney Princess Half Marathon. And since Natalie is part of the running crowd that doesn't like my advice to back off their training schedule and rest, instead I suggest some extra yoga. When knees begin to hurt, I first look at what's going on in the hips. My students know I say all the time "it's all connected", so an imbalance in one area will certainly cause problems in another area. Because of the repetitive motion, running often causes tightness in the hip flexors, hamstrings, quads, IT band - which can all lead to pain in either the lower back or knees. 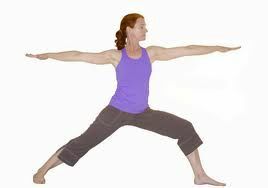 When I design a yoga class for a runner, I like to not only stretch but also to strengthen the muscles supporting the knee. Virhabhadrasana II (Warrior 2) with a folded up yoga mat under the front toes. Placing the front toes on a folded mat relieves pressure on the front knee while strengthening surrounding muscles. Virsasana (Hero's pose) full hero's pose isn't available to most people, especially runners with tight quads and hips. Try placing a folded blanket or yoga block underneath for additional height and support. A few years ago when I hurt my knee, I sat on a stack of books twice a day. I gradually lowered the height of the books as my knee got stronger and eventually was able to sit on the floor again. Eka Pada Rajakapotasana (One legged king pigeon) - again, the full version of the pose probably isn't accessible to most people just starting out. But modified versions are just as effective. Vriksasana (Tree) - opens the hips, strengthens ankles, improves balance and coordination. If the knee is in pain or uncomfortable, lower the foot to the shin so there is less flexion in the up knee. Observe the first Yama of Patanjali's Eight Fold Path - Ahimsa. Ahimsa is translated as non-violence, but really it just means do no harm. Practice ahimsa to yourself and your body. Know when to challenge yourself, and know when to listen to your body's signals, back off and rest. When I go to Jilda's class, she does theme classes. When I do yoga alone, I do everything I can remember (which varies every time I do yoga). I can do most of the poses discuss here, but It's hard to do the hero's pose now because it hurts the old knees. Pigeons seem to make them feel better.